On Sunday I dropped my iPhone 3 down the toilet. Not deliberately, of course, but my bathroom is small, the toilet crammed next to the basin, and the phone slipped from my loose pocket as I was brushing my teeth. Along with my iPhone it felt like I’d flushed my whole life – photos, contacts, passwords, videos, apps, etc. I managed to stay calm, thinking: “Okay, good time to practice patience, non-attachment, mindfulness of impermanence etc etc!” But it was a little wake-up call, and not just reminding me to back up my data in future 😉 (Why do we always have these good ideas only AFTER disaster has struck?!) Even after three days submerged in rice, the phone is dead. All that is left from its data is what I can remember. It is a bit like dying and only taking my mind with me to my next life. The Tibetans have a saying about death, that it is like a hair pulled from butter. They like yak butter tea, (or yuck butter tea as I can’t help thinking of it), and the butter arrives wrapped in a yak skin. Some yak hairs inevitably get into the butter and have to be pulled out. They come out smoothly, leaving all the butter behind – in the death analogy, this would be our body, possessions, home, career, people, gross minds and personality. All that continues to our next life is our subtle mental continuum and our karmic imprints, from which a whole new world is going to arise like another dream. Can you find Steve Jobs within his parts? Steve Jobs, co-creator of Apple, probable genius and Buddhist, died yesterday from pancreatic cancer at the age of 56, apparently peacefully. Like a hair pulled from a ton of butter, he has left the entire empire he built behind. What has gone with him? Of course there are varying opinions about whether what he did was brilliant or exploitative, generous or self-seeking… It is impossible for us to judge what karma he has created — that depends entirely on his intentions for doing what he did, which only he could have known. 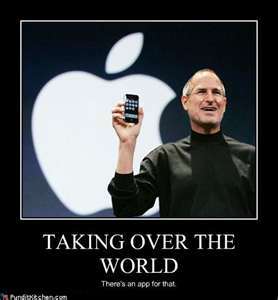 But I think it’s fair to assume that he created very strong karma in that he influenced much of the world and provided insanely cool gadgets used (or abused) by millions of people. My teacher Geshe Kelsang once said that modern technology is rather like “modern miracle powers”, and its true – imagine showing someone born in the 19th century your iPad?! Even when I demonstrated my iPhone offline to some children in a Brazilian rainforest (who’d didn’t have running water or electricity, let alone any space-age gadgets), they got very excited! Tom the Talking Cat, anyone?! 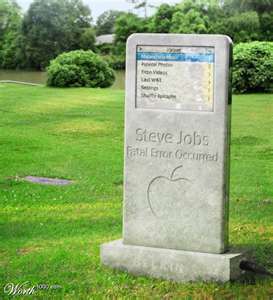 Stand up the real Steve Jobs! Whatever his motivation and effects on other people, Steve Jobs did make my own life a little easier when I was living out of suitcases for a while and didn’t have a computer or any other gadgets to stay in touch with family and friends. His invention enabled me to take photos of the wonderful places and people I visited, gave me the ability to maintain this blog, helped me navigate new streets, and entertained me. Sure, my entertaining iPhone could distract me too (a lot), and I’m not celebrating my admitted attachment to technology, but I’m not going to blame Steve Jobs for that – I’m a big girl now and can take responsibility for controlling my own time and mind. For me, overall, he was kind. Stand up the real Amanda Knox! Another big story that touched hearts poignantly or painfully this week was the acquittal of Amanda Knox. Was she guilty or not? We may never know for sure. (I always thought she was innocent, but that’s just my opinion.) In any event, she has suffered a great deal these past four years and if she is guilty of murder her karma will catch up with her – so I’m glad she has the chance to go home at least for now. Did you see her face while she was waiting for the 3:30pm ruling on Monday? The tension was extraordinary. How did that feel? We’ll find out ourselves soon enough, within a few hundred months at most, when we are a hair pulled from butter … will the karma we have created condemn us to a dank lonely cell or send us home to freedom? She’s right, it isn’t. Every now and then, usually when things are changing too fast for us to get a fixed handle or label on them, we have a natural glimpse into the ever-moving dream-like nature of our lives. I pray that our next life is also an upgrade. Please leave your comments on the blog, and share this article if you like it.